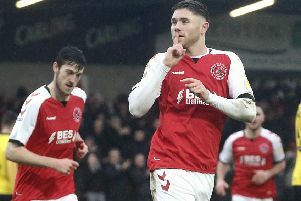 Fleetwood boss Joey Barton expects Wes Burns to be back battling for a spot in the Town side to face Luton on Saturday after his ankle injury. Burns, 24, had slotted in at right-back while Lewie Coyle was suspended. But he limped off in the latter stages of Town’s win over Charlton 10 days ago and Leeds loanee Coyle replaced him at Bradford on Saturday after completing his three-match ban. Barton did not want to risk Burns at Valley Parade, where Coyle helped Town to complete their first back-to-back wins since October. However, the Town boss confirmed that scans on the ankle were positive and Burns should be available to face the league leaders. Barton explained: “Wes came off with a knock. Everything was as good as it could have been in terms of the scan but he did have a little bit of inflammation and discomfort in there. “He tried to train on Wednesday but was sore. He is a big player for us and we made a decision. We knew we had Coyley, who is a fantastic man we knew could slot in. He has been awesome all season and he deals with whatever comes his way. James Wallace is a doubt for the Luton game, having been forced off after half an hour at Bradford. One man out of the treatment room is club captain Craig Morgan, though he had to settle for a place on the bench last weekend as Ash Eastham and new signing Harry Souttar earned a second successive clean sheet in the heart of defence. Barton added: “I don’t want players to play with knocks and niggles unless they absolutely have to. “The skipper (Morgan) was back on the bench on Saturday after a little bit of ‘R and R’ time to get his body right.But he is the first in there giving congratulations to the lads in his slot and that is a sign of a real team. “We have got no bitterness or ‘I should be doing this; I should be doing that’, which has not always been the case. “I expect players to be disappointed if they do not play but then you have to knuckle down and be a team player. “We have a really strong core group, who appreciate being part of a strong team. You can feel that culture building.